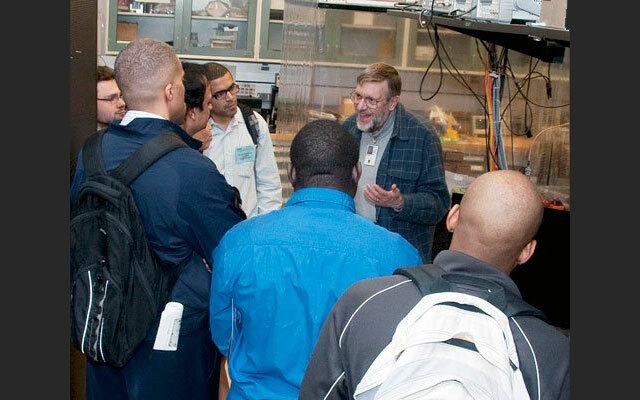 Bill Phillips explains the process of cooling and trapping atoms in a lab at NIST. 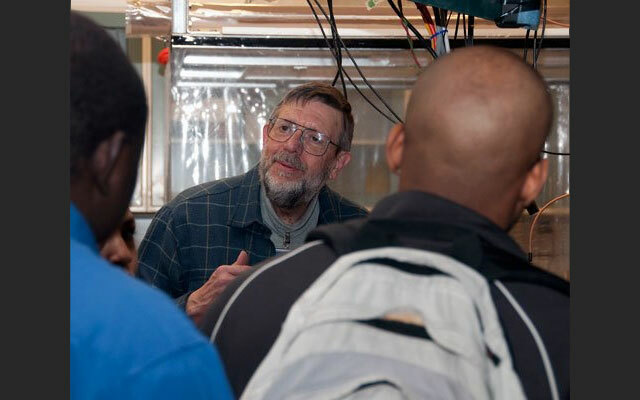 Bill Phillips answers questions about laser cooling. 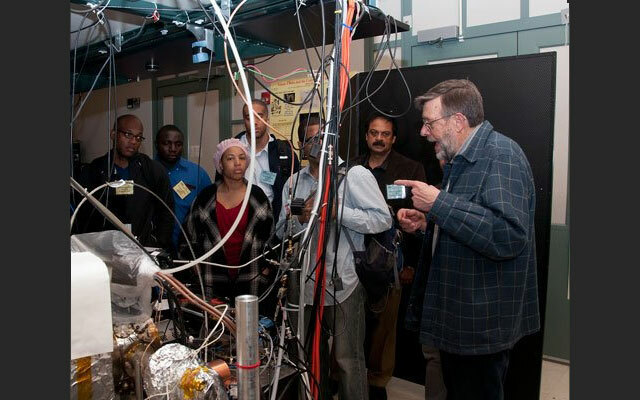 Left to right: Phillips, Philip Kurian, Charlezetta Wilson, Prof. Misra, Tehani Finch, Sidi Maiga, Osaro Harriott and Steve Olmschenk of NIST's Laser Cooling and Trapping Group. Bill Phillips listens to students. Bill Phillips explains the laboratory apparatus. Left to right: Osaro Harriott, Sidi Maiga, Charlezetta Wilson, Tehani Finch, Philip Kurian, Prof. Misra, Phillips. Carl Williams talks about quantum information science. Left to right: Tehani Finch, Charlezetta Wilson, Philip Kurian, Sidi Maiga, Prof. Misra, Williams. Carl Williams answers questions. 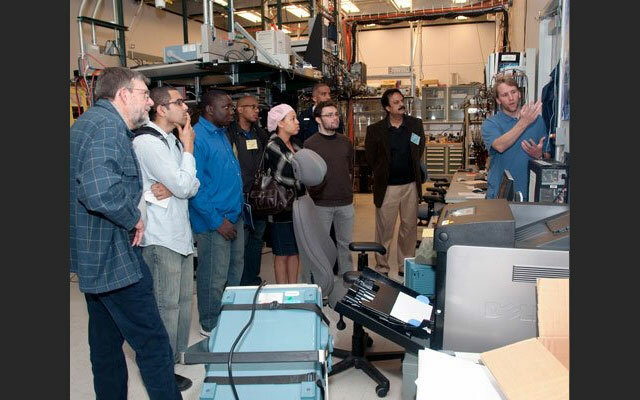 Left to right: Williams, Steve Olmschenk and Lucas Beguin of NIST, Osaro Harriott, Charlezetta Wilson, Tehani Finch, Sidi Maiga, Philip Kurian (at back), Prof. Misra. Alan Migdall explains aspects of his work on photons. Left to right: Tehani Finch, Charlezetta Wilson, Migdall, Sidi Maiga, Lucas Beguin (at rear), Prof. Misra, Philip Kurian, Osaro Harriott. Joshua Bienfang describes his work on quantum encryption. Left to right: Prof. Misra, Steve Olmschenk, Charlezetta Wilson, Tehani FInch, Sidi Maiga, Philip Kurian, Lucas Beguin, Osaro Harriott. Prof. Misra expands on a point with Bill Phillips. Left to right: Phillips, Philip Kurian, Sidi Maiga, Charlezetta WIlson, Lucas Beguin, Tehani Finch, Misra. Bill Phillips uses an piece of foam rubber and ball bearings to demonstrate how atoms are trapped in an optical lattice. Clockwise from left: Phillips, Osaro Harriott, Sidi Maiga, Prof Misra, Tehani Finch, Charlezetta Wilson, Philip Kurian. Steve Olmschenk (far right) describes a current project using a wall poster. From left: Bill Phillips, Philip Kurian, Sidi Maiga, Osaro Harriott, Charlezetta Wilson, Lucas Beguin, Tehani Finch, Prof. Misra. 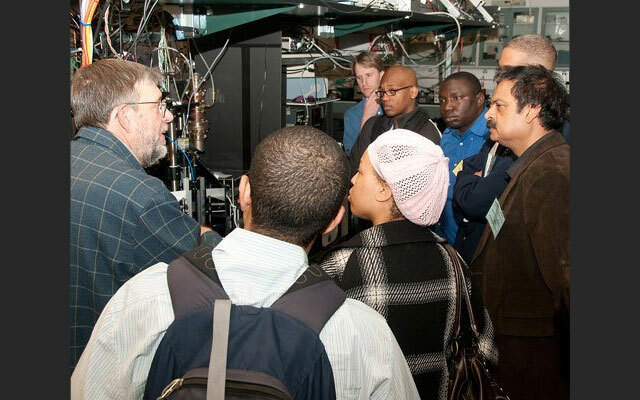 On March 11, 2010 a group from the Department of Physics & Astronomy at Howard University in Washington, DC visited the National Institute of Standards and Technology (NIST) for an introductory tour of several projects and program areas related to the Joint Quantum Institute (JQI). Two Howard professors -- Dr. Prabhakar Misra and Dr. Silvina Gatica -- and 10 of their students spent the afternoon watching multiple presentations about quantum information science research and asking questions about the work. The group heard from four presenters: Nobel laureate William D. Phillips, leader of the NIST Laser Cooling and Trapping Group and Co-Director of the Physics Frontier Center at JQI; Carl J. Williams, Chief of NIST's Atomic Physics Division and Co-Director of JQI; Alan Migdall, Staff Physicist in the Optical Technology Division at NIST; and Joshua Bienfang, Staff Physicst in the Electron and Optical Physics Division. 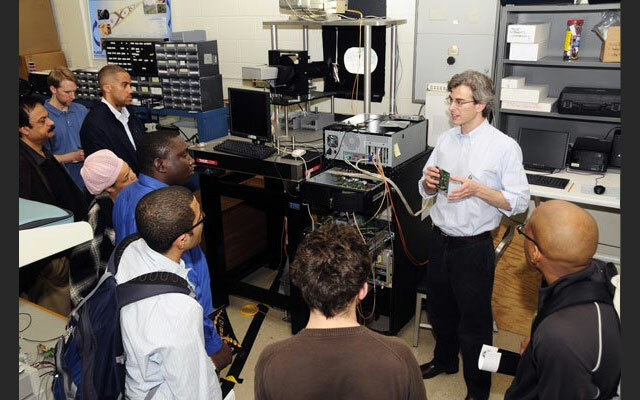 In addition, NIST/JQI postdoctoral researcher Steven Olmschenk of the Laser Cooling and Trapping Group served as tour guide and explained various aspects of the science.